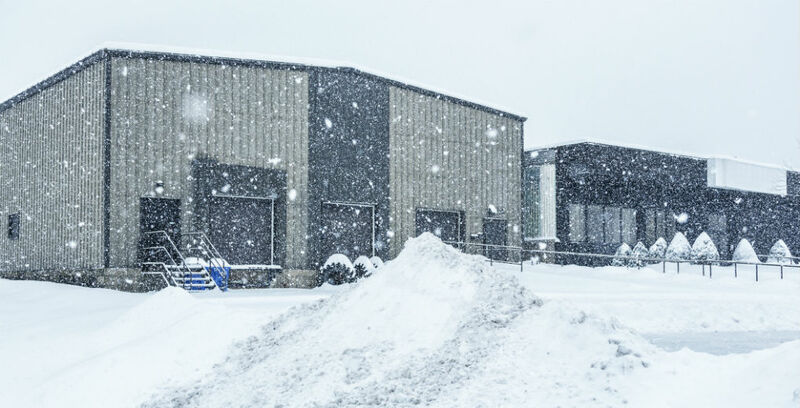 Whether a warehouse forms just part of your retail operation, or storage and distribution is the core of your business, plummeting temperatures can cause warehouse chaos. Frozen pipes or damaged stock could mean significant repair and replacement costs, as well as delays, business interruption and broken contracts – and could even stop you trading altogether. Here are Hink’s Insurance’s top tips for avoiding a winter business disaster. In an ideal world your warehouse walls would be fully insulated to prevent a freeze, but if time and cost are at a premium you should pay particular attention to the areas which lose most heat – doors and windows. Protect large dock doors with weather stripping kits, while double-glazing windows and skylights will save you money in the long run. Indoor and outdoor shelving braces can become brittle in the cold, while any fixtures and fittings which are already damaged could deteriorate to the point of breakage. Avoid sending precious products crashing to the ground by maintaining and repairing shelving, pallets and storage equipment. Leaking or blocked pipes can drip water onto your warehouse floor. Even if it never amounts to a full-blown flood, these droplets can sink into grooves and dents, before freezing and thawing several times which causes cracks to develop. Regularly lag and insulate your pipes to prevent repair costs mounting. If you store certain materials and products at specific climates, make sure to check over control systems and carry out maintenance before cold weather has a chance to spoil any stock. Pumping heat into your warehouse but not feeling any effect? Rising hot air means large, lofty warehouse spaces are difficult to warm. Make sure air fans are functioning properly to keep heat moving, and if possible segregate your warehouse into sections so you can just heat the ones people are working in. Employee slips and trips are always bad news for business, with staff absences leaving you short-staffed – and potentially liable for their injuries. With the change in weather increasing risks, make sure outside paths, entrances and car parks are cleared of snow and gritted against ice. You should also check your outdoor lighting, as darker afternoons and potential snowstorms obscure visibility. Colds, coughs and flu are all more prevalent in winter, so ensure the workplace’s ambient temperature never falls below 13°C – this is recommended by the Health & Safety Executive in jobs which involve rigorous physical effort, though you may use your discretion as long as the temperature is “comfortable”. Unpredictable conditions can have an impact on warehouse vehicles. Regular servicing will help stave off mechanical malfunctions, while winter tyres will increase grip. Put together a checklist of pre-work steps for forklift operators – including engine warming, fluid level checks and stability-aiding weight blocks. Ensure staff members are well enough to work and have suitable wind and weather- proof clothing, gloves, headgear and hi-vis outerwear to combat reduced visibility. Stocking up on grit can also help guard against slippery surfaces. Though most products will be stored inside year-round, make sure to bring in any stock you do normally keep outdoors before snow and ice affects it, and make sure to take this into account when calculating storage space. Ensure your warehouse, products, vehicles and employees are fully protected with specialist insurance. Call Hink’s Insurance today on 01482 323424 to speak to our experts.